World class high school mathematics content with inspiring stories and fun facts. The Golden Ratio is everywhere! E-mail Enter valid Mail Id! Parents E-mail Enter valid Mail Id! An activation link has been sent to your email address. Please check your emails. 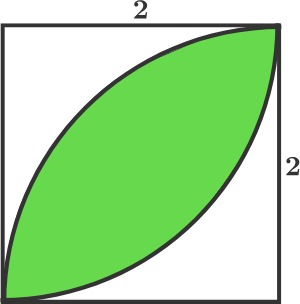 The green, leaf-shaped area below is the region of overlap between two circles of radius that are centered, respectively, at the two opposite corners of the square. What is the area of this green region? 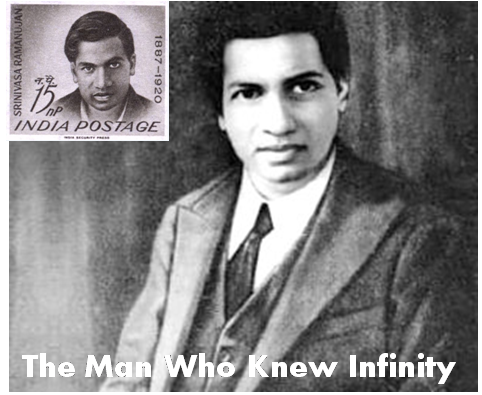 Srinivasa Ramanujan is the greatest mathematician to come from India. He was largely a self-taught mathematician. Hindered by poverty and ill-health, his original work has considerably enriched the fields of sciences such as number theory and, more recently, physics and he tragically died at the tender age of 33 (1887 -1920). Although a math prodigy, he failed to get a college degree, as he did not clear his fine arts courses. However, he wrote to Professor G.H Hardy while working as an accounting clerk with the Madras Port Trust who accepted him at Cambridge in April 1914, seeing his prodigious talent for mathematics. In 1916, he got the equivalent of a Ph.D. and in 1918 he became the first Indian to be elected as a Fellow of the British Royal Society. In India, we celebrate National mathematics day on 22nd December in honor of his birthday. Once when Ramanujan was in the hospital, Professor Hardy came to visit him and mentioned that the Taxicab he came in had the boring number 1729 and hoped that it was not a bad omen. Ramanujan immediately replied that it was, in fact, a very interesting number as it was the smallest number that could be expressed by the sum of two cubes in two different ways.